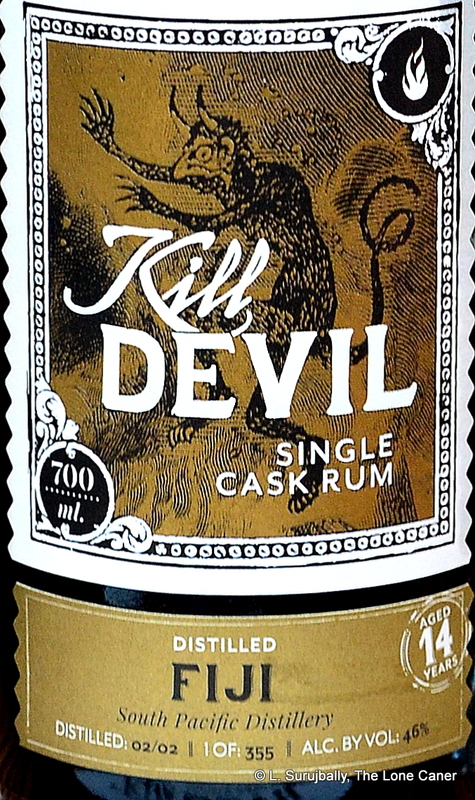 Kill Devil is the rum brand of the whiskey blender Hunter Laing, who’ve been around since 1949 when Frederick Laing founded a whisky blending company in Glasgow. In 2013 the company created an umbrella organization called Hunter Laing & Co, into which they folded all their various companies (like Edition Spirits and the Premier Bonding bottling company). The first rums they released to the market – with all the now-standard provisos like being unadulterated, unfiltered and 46% – arrived for consumers in 2016, which meant that this rum from the South Pacific Distillery on Fiji, was issued as part of their first batch (oddly, their own website provides no listing of their rums at all aside from boilerplate blurbs). When the time came for me to decide what to sample, the 17 YO Cuban from Sancti Spiritus was one, and this was the other, because let’s face it, you can always get a Jamaican, Bajan, Trini or Mudland rum plus several agricoles whenever you turnaround, but Fiji is a bit rarer. 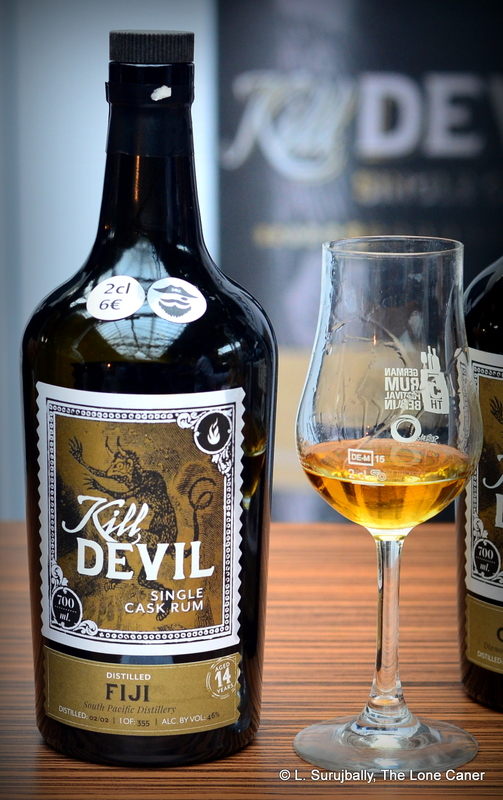 Pale gold in colour – though darker than the Cuban – the Kill Devil Fijian rum came out in 2016 and continued the recent upsurge in issuance of independent bottlers’ Fijian rums, and stuck with the relatively modest 46% ABV so as not to scare too many people off. Like most indies’ releases, it was also pretty limited, a mere 355 bottles from a single cask, European ageing, but thus far I’ve been unable to ascertain whether it’s a pot still or column still product. Never mind, though. Like most rums from the Pacific which I’ve tried, this one was off woolgathering in its own time zone, not only different from the Caribbean and Latin rums but from other Fijians – not entirely sure how they do that. Consider: the nose began with a clear scent of papier-mâché (wtf, right?) – sort of starchy and floury – as well as cereals like fruit loops without the milk. That was the just beginning, however, and things smoothened out over time (which was a good thing) – it added yoghurt, tart and somewhat sour fruits, some funkiness of a Jamaican wannabe, cloves, fanta, lemon rind and the sweetness of freshly cut pineapple mixing in the background with some softer briny notes. On the palate the fruits started to take over, tart and a unripe, like ginnips and soursop together with ripe mangoes, pineapple and cherries in syrup right out of a can – there was hardly any of the brininess from the nose carrying over, and as it developed, additional hints of pears, watermelon, honey, and pickled gherkins were clearly noticeable. It was warm and crisp at the same time, quite nice, and while the long and heated finish added nothing new to the whole experience, it didn’t lose any of the flavours either; and I was left thinking that while different from other Fijians for sure, it seemed to be channelling a sly note of Jamaican funk throughout, and that was far from unpleasant….though perhaps a bit at odds with the whole profile. Overall, I quite liked the rum, particularly the understated element of funkiness in the background. Although the pantheon of Caribbean rums was in no danger of being dethroned by it, I get the impression with every Fijian rum I’ve sampled, that even if South Pacific themselves aren’t making any world beaters (yet), the independents are amusing themselves by continually, if incrementally, raising the bar. Every year I seem to find a new Fijian rum out there which pushes things, just a little – adds a small something extra, goes out into left field a little further, plays about a tad longer. The Kill Devil 14 YO Fijian rum doesn’t exactly set the world on fire for me, but there’s little to complain about, since it shows that the Caribbean doesn’t have complete dibs on good rums and holds great promise for the future. It’s a neat addition to our mental inventory of rums from the Pacific.